You are here: Home / Weekly Columns / Opinion / 3 Sports Tricks Every Guy Should Know. 3 Sports Tricks Every Guy Should Know. (ThyBlackMan.com) Even if you’re not a sports nut and you never claimed to be, a lack of sporting knowledge is something of a stigma among men. First of all, it’s embarrassing when your buddies start talking about “the game” and may as well be speaking another language. Secondly, we all need to stay active somehow! I can’t turn you into an expert, but here are three sports skills every guy should know. If you consistently get the highest strokes every time you go for a round of golf, then learning how to slice could be the answer to your prayers! Slicing is basically hitting your ball at an angle rather than head-on with the club face. This may be something you do already out of sheer ineptness. However, when you’re in the rough a good slice can bend your ball towards the green, and save you another round of teasing! When sizing up the shot, be aware of where you want the ball to go, then adjust your shoulders slightly towards that direction. When you swing, it’s also important to keep your hands and wrists stiff, rather than rotating them as you would with a drive. This keeps the club face open, rather than dipping down over the ball. You can find more golf tips at Fairway First Golf. If you’re even vaguely into football, then you’ve probably heard of a “perfect spiral” come up more than once. 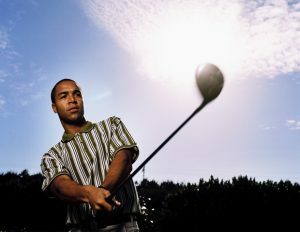 When this is pulled off correctly, a seasoned player can make the ball arc gracefully through the air, or dart in one straight line towards his target. It’s done by gripping the back half of the ball with your fingers spread out between the laces. Open your stance somewhat, and stand with your shoulders in-line with the guy you’re passing to. Then, drive your empty hand down towards your hip, and bring the ball up in an overarm motion. The real challenge is all in your fingertips. At the top of your release, you need to snap your hand downwards and cause the ball to roll off your fingers. This sets the actual “spiral” in motion. Despite the name, you don’t want the ball to actually dip and circle as it flies. The spin should be so rapid that it’s nearly invisible! Visit Active for more tips on playing football. Okay, bowling isn’t the best possible workout a far as sports go. However, it’s an annoyingly popular pastime which you won’t be able to escape sometimes! If you want to really wow your friends, learn how to pull off the hook. This is that awesome spinning motion which makes your bowl drift towards the gutter, but then curve back to the centre for a strike. For this, you should be gripping the ball down to your first knuckle, rather than the second. While bringing your arm forward for the release, don’t get too much momentum in it. Then, let the weight drop the ball to the lane, and use your fingers to flick the ball in the direction of a spin. Then, watch the magic happen!